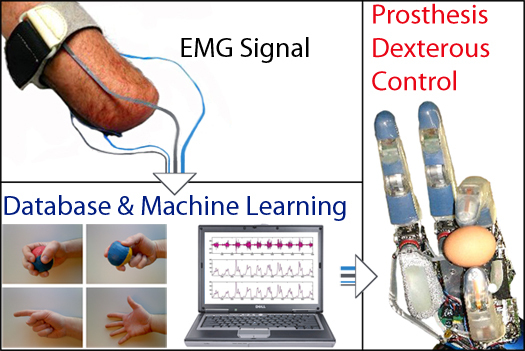 Developing a family of algorithms to augment the dexterity and reduce the training time for surface electromyography controlled prosthesis of the hand. Daily life of hand amputees can be poor compared to what it was before the amputation. The state of the art of hand prosthetics currently offers only very simplified movements (open/close), very coarse control of the force, and long training times to learn how to control the movements via surface electromyography (sEMG). This contrasts with recent advances in mechatronics, thanks to which high dexterity mechanical hands (characterized by many degrees-of-freedom and force control) are being built. The goal of NinaPro is to develop a family of algorithms able to control high dexterity sEMG prosthesis and to reduce the patient training time.